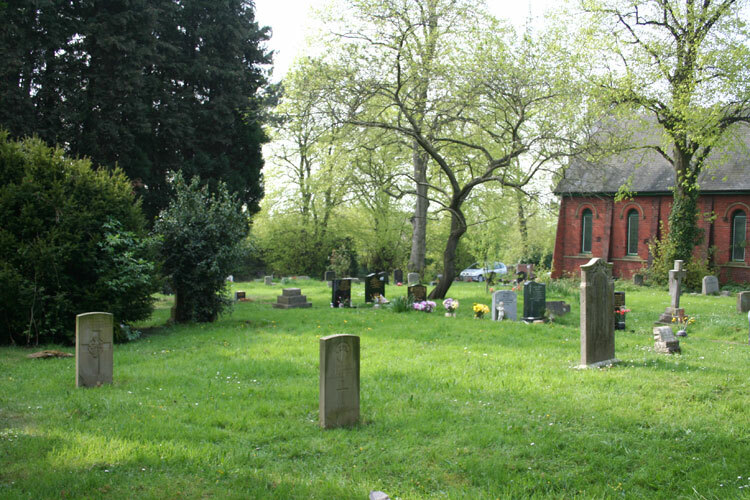 Yarm Cemetery contains 4 graves from the First World War, one of which is that of a soldier of the Yorkshire Regiment. However, one of the other War graves includes the commemoration of a soldier of the Yorkshire Regiment on the headstone of one of his brothers. 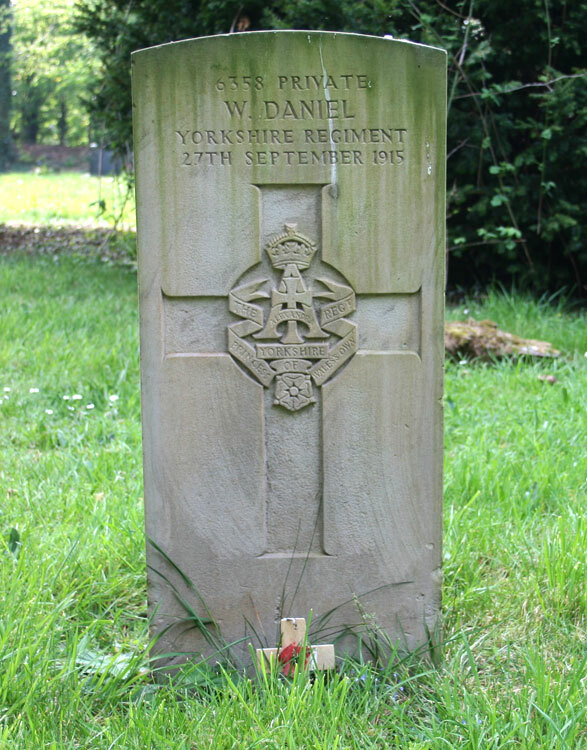 The grave of Private William Daniel in Yarm Cemetery. Private William Daniel, 6358. 2nd Battalion the Yorkshire Regiment. Husband of the late Susannah Daniel. Died 27 September 1915. Aged 33. "William had enlisted in the army on 6th August 1900 and was in the Sheffield Barracks with the Yorkshire Regiment. In 1908 he left the army and married Susannah Kemp on 15th May 1905 at St Jude South Shields and by 1911 was living as a colliery joiner above ground at 3 room Black House Terrace in Pelton. Their first child had died and the couple were bringing up thier daughter of 8 months named Gertrude Ellen. He must have found life outside the army hard as he signed up for a further four years with the Yorkshire Regiment in 1912. The records sometimes erroneously recorded his name as William Daniels. However, the WW1 Medal Rolls Index card for William Daniels corrects the error. It indicates that William disembarked with the British Expeditionary Force on 14 November 1914. He was discharged on 5 May 1915 as no longer physically fit for war service (nephritis). His mother was living in Carlton Terrace in Yarm. Suzannah was living at 26 Lawson Street in Ferryhill. His medical record of 6th March 1915 indicated that his nephritis occured shortly after arriving in France due to chill and wet conditions in the trenches. The Medical Board on 9th March at 1st Western General Hospital, Fazakerley in Liverpool indicated the disability was permanent." Yarm Cemetery. William Daniel's headstone is on the left. The headstone in the centre is that of Serjeant Campion of the Grenadier Guards. Yarm Cemetery. The headstone commemorating the three Cordingley brothers. 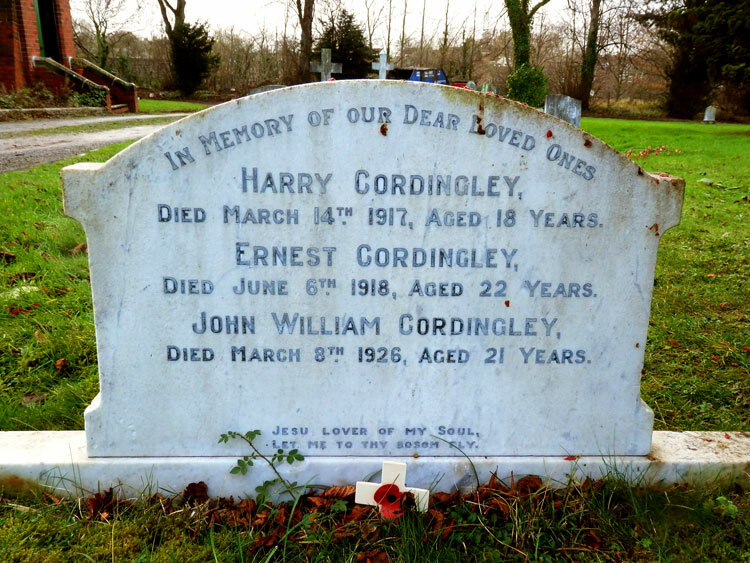 Private Harry Cordingley, TR/5/82234. 90th Training Reserve Bn.King's Own Yorkshire Light Infantry. Private Ernest Cordingley, 21433. 4th Battalion the Yorkshire Regiment. Son of John and Martha Cordingley, of Orchard House, Egglescliffe Village, Co. Durham. Died 4 June 1918. Aged 22. Born Yarm (Yorks), Enlisted Stockton-on-Tees, Resided Eaglescliffe. Buried ST. SEVER CEMETERY EXTENSION, ROUEN.